The Pennsylvania Department of Education recommends that professional employees who have received a Satisfactory summative rating in the previous two years should be eligible to participate in Differentiated Supervision. Prior to the 2013-2014 school year, a Satisfactory performance rating using a previously approved rating form, e.g., PDE 5501, PDE 426, PDE 427, or PDE 428 may be used to qualify for participation in Differentiated Supervision. The Pennsylvania Department of Education recommends that professional employees newly hired by a district should be eligible to participate in Differentiated Supervision, but only after successfully completing their first year in the Formal Observation Model. The Pennsylvania Department of Education recommends that temporary professional employees should not participate in Differentiated Supervision. 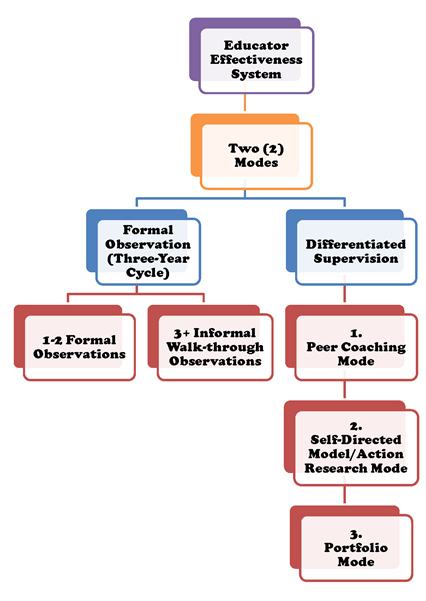 Professional employees should be assigned to Differentiated Supervision Modes for the length of the Cycle of Supervision except for the required year of Formal Observation; that is, if a district has a three-year Cycle of Supervision and a teacher is assigned to the Formal Observation Model in the second year of the cycle, the teacher would be placed in Differentiated Supervision in years one and three of the cycle. A Cycle of Supervision usually lasts for three (3) or four (4) years; however, this is a local decision. The principal and the professional employee should collaboratively create a timeline to ensure the successful completion of the professional’s Differentiated Supervision Action Plan. The professional employee should be required to complete a mid-year review and an end-of-the-year self-reflection report with respect to his/her goal setting, planning, progress, and results. It is also recommended that the professional employee report the findings of his/her action plan to a Professional Learning Community (faculty meeting, professional education day, etc.) The supervising administrator should select a Differentiated Supervision Mode in collaboration with the teacher. All Differentiated Supervision Modes must be aligned to the Danielson’s Framework for Teaching or a PDE approved alternative system and/or related to a district or school initiative designed to improve instructional practices and impact student achievement. Additionally, while formal observations may not occur in Differentiated Supervision, it is recommended informal observations (walk-throughs) occur throughout the school year. The Pennsylvania Department of Education recommends that the principal also reserves the right to remove a teacher from Differentiated Supervision at any time and place the teacher in the Formal Observation Model or assign the teacher to a Performance Improvement Plan with Intensive Supervision. While the nomenclature applied to the various Differentiated Supervision Modes may be unique to each LEA, they are generally grouped by common subject matter. Districts are not limited to the following categories as long as the mode meets the requirements and rigor of the The Pennsylvania Department of Education Teacher Effectiveness System. Peer-Coaching Mode – professional employees work in dyads or triads to discuss and observe their own or another professional employee’s pedagogy, student learning, curriculum aligned to the Pennsylvania Core Standards and other pertinent issues in a collaborative manner. The professionals will work together to define their professional needs and develop plans to assist them in the successful completion of the identified tasks including: specific target area(s), the evidence to be collected, observation dates, and a reflective session. Meeting notes, data collection tools, results of the observations, and the reflective sessions should be shared with the principal and used as evidence in the supervision and evaluation of the employee. Self-Directed Model/Action Research Mode – professional employees will develop a structured, on-going reflection of a practice-related issue (Danielson’s Framework for Teaching or a The Pennsylvania Department of Education approved alternative system). Professionals may work individually or in small groups, dyads or triads, to complete the action research project. Meeting notes, resources, data collection tools, and the results of the reflective sessions should be shared with the principal and used as evidence in the supervision and evaluation of the employee. Book/research reviews are unacceptable for a separate Differentiated Supervision mode; however, they may be used to develop the research for an action plan. Portfolio Mode – professional employees will examine their own practice in relation to the Danielson’s Framework for Teaching or a The Pennsylvania Department of Education approved alternative system and reflect in a written report and/or documented discussions with colleagues. Portfolios may be developed according to criteria established collaboratively by the administrator and the teacher based upon their interests or needs. Resources, data collection tools, and the results of the reflective sessions should be shared with the principal and used as evidence in the supervision and evaluation of the employee. A teacher portfolio is an anthology of achievements that the teacher has accomplished, both in the classroom and elsewhere. It is a personal document that is designed to display the teacher’s talents and proficiency, and it demonstrates a teacher’s knowledge and skills. What the teacher includes is always a matter of intent. The teaching portfolio describes and documents multiple aspects of a person’s teaching ability. It is a mechanism and space for reflecting upon one’s teaching. The format of a portfolio can vary considerably, but an effective portfolio should be structured, representative, and selective. It is structured in that it should be organized, complete, and creative in its presentation. In addition to attending to structure, the portfolio also should be comprehensive and should be representative of one’s work. The natural tendency for anyone preparing a portfolio is to document everything. However, careful attention should be given to conciseness and selectivity in order to appropriately document one’s work.